Heliotropism – A Plant's Response to Light! Heliotropism is a plant's turning response (mostly diurnal) to light intensity and direction. Plants can either face the light (positive response) or turn away from it (negative response). Heliotropic plants are solar tracking plants! 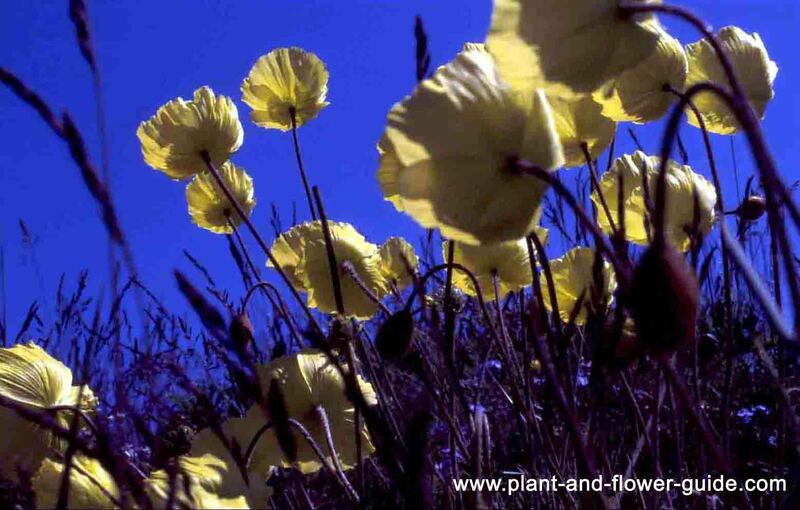 Arctic poppies (Papaver radicatum) - all facing the sun! Have you ever been driving in the morning along a sunflower field (Helianthus annuus)? And have you observed how the flowers and leaves all show towards the rising sun and the sunflower plants are aligned all in the same direction just like a group of soldiers? And well, have you then passed the same field in the evening before sunset? The plants now all face the sun in the opposite direction as in the morning! The sunflowers responded to the sunlight (isn’t the plant’s name striking? In French they are even called “Tournesol” and in Spanish “Girasol” which means, “turning sun”). They want to catch as much light as possible. They turn during the day with the sun from east to west so they can face the sunlight all day long. Light is needed for photosynthesis. And photosynthesis converts carbon dioxide into organic compounds. The plants need these organic compounds in order to grow healthily and steadily and to reproduce successfully. Studies showed that sunflowers can gain almost 15% energy with this juggling movement! The effort is very well worth it! At night the plant “moves” only a little bit and irregularly. Then, in the morning, at the time of sunrise, the flowers and leaves turn again all together toward the sunlight. Yet, once the plant is grown to adulthood the ability to move with the sun disappears and the sunflowers always face east. How Exactly do the Plants Move? Some plants move the flowers and the leaves towards the light source (as the sunflower does), others, may move either one. Below the flowers and the leaves is a flexible segment, the so-called pulvinus. In the pulvinus are motor cells, which regulate the turning movement through changes in turgor pressure. Photoperiodism is also a reaction to light. It is the reaction to the length of the daylight (photoperiod).